Last year’s event drew almost 100 people and raised over $100,000 for the SA (Servants Anonymous) Foundation. Calgary Icebreaker Polar Dip co-founders Ross Weaver (left) and Bernie Potvin (right) at the 2015 event. Photograph by Jason Nessler. 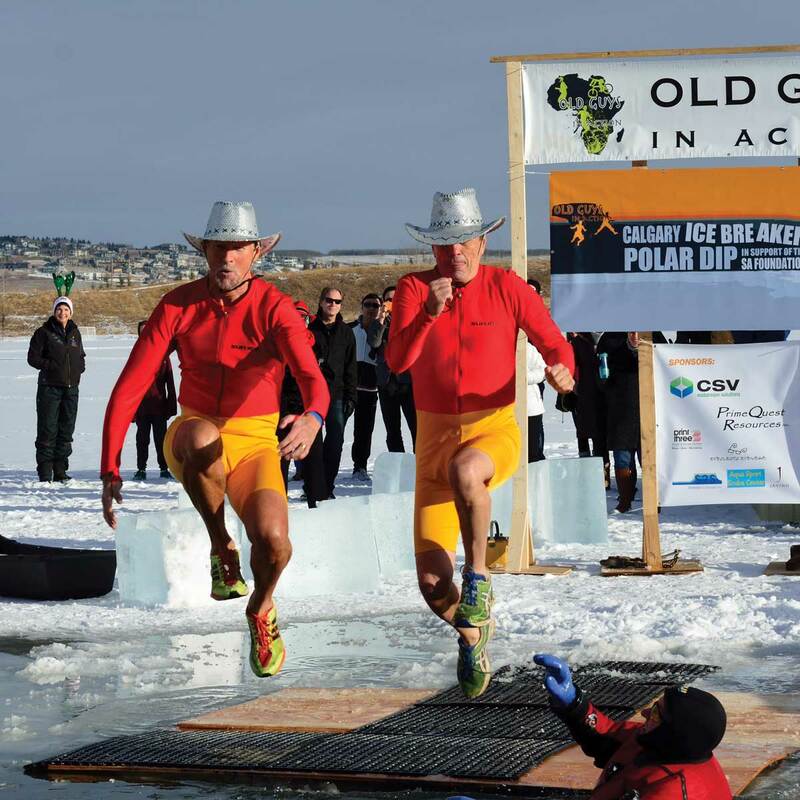 For the 10th year in a row, Ross Weaver, 65, and Bernie Potvin, 68, will jump into ice-cold water on New Year’s Day. This wild stunt raises awareness and funds for the SA (Servants Anonymous) Foundation, an organization that helps women and girls who have been, or are at risk of becoming victims of sexual exploitation and human trafficking. Weaver and Potvin won’t be the only ones getting cold in support of this cause: they’ll be joined by fellow participants in the Calgary Icebreaker Polar Dip, an event that drew almost 100 people and raised over $100,000 for the SA Foundation on New Year’s Day 2018. Weaver and Potvin, who work in oil and gas and education consulting, respectively, are the founders of Old Guys in Action, a group of men — and women — who do physically demanding adventure and endurance challenges to raise funds and awareness for local and global charitable organizations that focus on poverty and justice issues. Having performed numerous charity challenges since the 1970s, the duo were inspired to take their charity work to the next level after doing development work in Zambia, Ethiopia and Haiti and seeing firsthand the need in those countries. They started Old Guys in Action 12 years ago to formalize their brand of giving back. “The name was picked more as a joke because we weren’t old, but we’re growing into that role now,” Weaver says. Weaver and Potvin have fundraised close to a million dollars as Old Guys in Action. In addition to founding the Icebreaker Polar Dip, they have run a marathon in Kenya, cycled across Guatemala and done the high-low expedition in Uganda — climbing to the highest point in the country then cycling to the lowest point. They intentionally choose challenges of an extreme nature to gain more awareness for the causes they’re supporting. “The inspirational people running these organizations are important to us and our approach is to do something that gets attention in order to bring these causes and inspirational people to the forefront,” Potvin says. 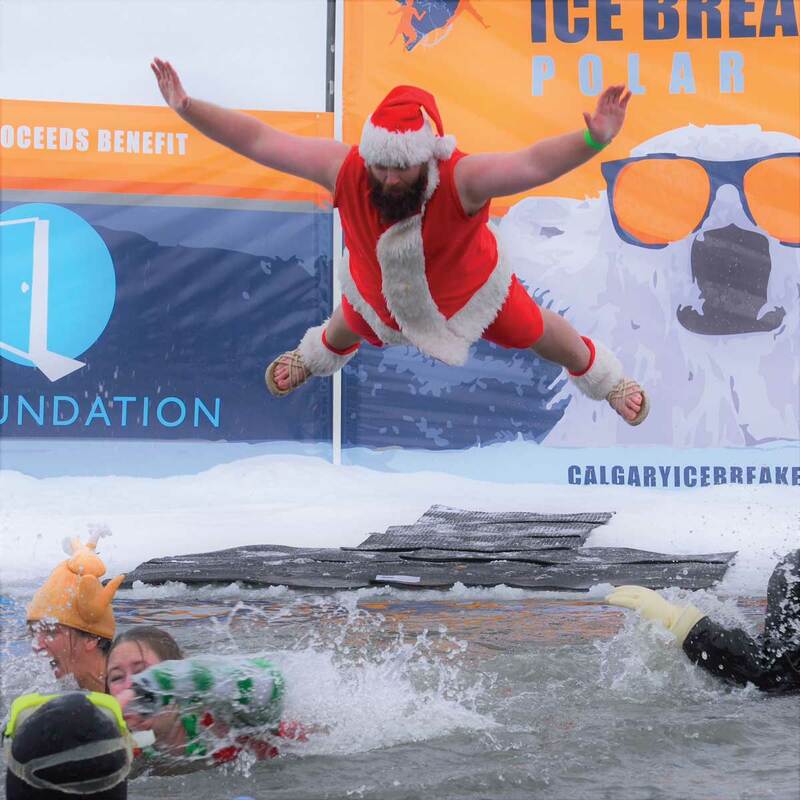 The Calgary Icebreaker Polar Dip remains one of their favourite events: compared to some of the other things they’ve done, jumping into freezing-cold water is a snap. “It’s the only thing we don’t have to train for,” Weaver says. A Santa suit-clad participant at the 2017 event. Photograph by Jason Nessler.